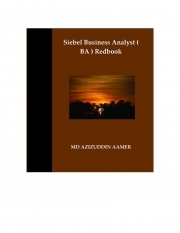 Description of "Siebel Business Analyst ( BA ) Redbook (eBook)"
This book describes the Typical Business Analysis Life Cycle. It covers working with Requirements like Identifying High-Level & Detailed Requirements , Interpreting Requirements , Documenting & Managing them.It covers Requirements Management and all Phases of SDLC in detail w.r.t to Siebel and the role Business Analyst in each of these Phases. It covers about AS-IS & TO-BE processes , swimlane diagrams , use cases. It also covers how to design functional designs for User Interfaces , Interfacing Systems and Data conversion. It covers how to prioritize & Validate requirements & different Validation techniques. It also covers how to conduct Gap Analysis & CRP ( Conference Room Pilot ). It covers Analyzing Requirements & solutions using Siebel eRoad Map Methodology. It also covers how to conduct a Business Process Workshop in depth. It also covers Exploring Business Process solutions library ( BPSL ) in detail. It also covers various approaches of Requirements gathering & Refining Requirements. It also discussed in detail and in depth the various types of requirements. Reviews of "Siebel Business Analyst ( BA ) Redbook (eBook)"